Now that the first doors are open on our Advent calendars, it’s time to think about entertaining. Today’s recipes are perfect – cheesy arancini balls make a wonderful starter or light meal, and Simon’s pavlova with chocolate and raspberry is a fantastic way to finish. Arancini are deep-fried balls made from leftover risotto. The word arancina literally means ‘little orange’ because of their shape and golden colour. Here, Simon stuffs each ball with a piece of mozzarella for an oozing cheesy centre. He serves the arancini with fresh tapenade to cut through the richness of the dish. This chickpea salad is a delicious lunch dish or light dinner. Simon deep-fries the chickpeas to add a deliciously crunchy texture, complementing the juicy baby tomatoes and fresh watercress leaves. He marinates the feta cubes in lime juice for an extra zingy flavor that cuts through the rich saltiness of the cheese. Kale is one of the tastiest greens (or purples!) to arrive on British plates each autumn, and in the past few years it has become one of the most talked-about vegetables, often dividing opinion. It is extremely nutritious and full of health-boosting vitamins and minerals; it has a lovely sweet flavour; and it is very versatile in the kitchen, working wonderfully in a wide range of recipes, from smoothies to soups. We’ve got a flavour-packed Friday celebration going on today: crispy polenta served with an intense, tomatoey pesto and Parma ham; and the ultimate veggie burger topped with strong cheddar and a proper burger sauce. This polenta recipe makes a delicious side dish or light meal. Simon serves the polenta squares with a fresh and zingy pesto to offset the creaminess of the polenta and the richness of the Parma ham. He adds extra texture by deep-frying to create a deliciously crunchy crust. Happy Thanksgiving! Today we have a fish stew to warm your cockles, and a pumpkin pie fit for a Thanksgiving feast. Tuck in. 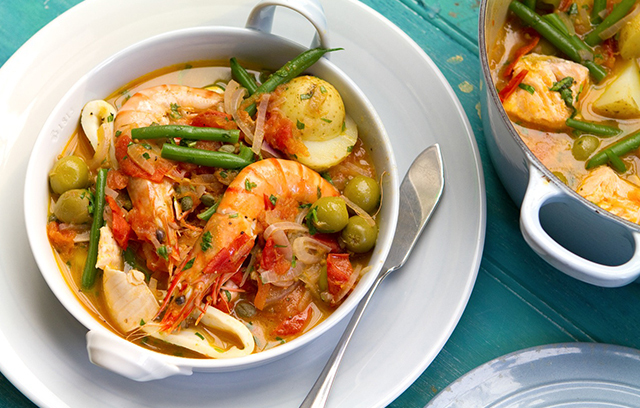 This fish stew is a hearty and warming winter treat. Unusually for a stew, it’s also really quick to cook, making it ideal for a midweek family meal. Simon adds a range of fresh fish and shellfish to the stew, but you could use whatever you have at home. Just cut the fish into similar size pieces so that it will cook evenly. Bored of grey skies and damp mornings? Today’s recipes bring you sunshine – first from Sicily and then from India – in the form of two delicious dishes. 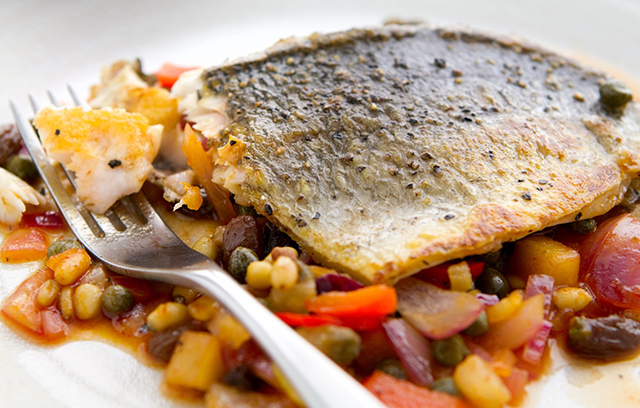 This fish dish is a really quick and nutritious midweek supper. 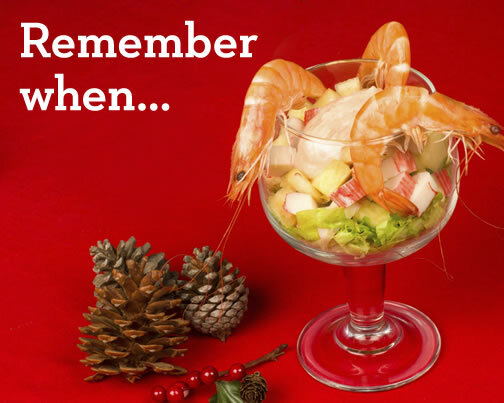 It’s the perfect way to get a taste of the Mediterranean in the middle of winter. Simon serves the bream with caponata, a Sicilian vegetable stew made with aubergines. Caponata is often served with fish, seafood or lamb, but can also be eaten as an antipasto with bread. Brrr… Today’s recipes add some comforting heat with smoky paprika, curry powder and chillis. Better than a hot water bottle. Curl up and tuck in. These curried squash pot pies are delicious vegetarian pies that meat-eaters will love too. Simon has made the white sauce with coconut milk rather than traditional cow’s milk so the pies are suitable for people who are lactose intolerant. He has added paprika and curry powder for a hint of spice that complements the sweetness of the roasted squash. This morning Simon’s dishes were heavily inspired by the Middle East, with lots of fragrant spices and deep, earthy flavours. Delicious. This aubergine dish is a delicious Middle Eastern-inspired recipe, which would be perfect as a light meal or starter. Simon is stuffing the aubergine discs with a hearty combination of minced lamb, bulgur wheat, tomatoes and aromatic spices. For a vegetarian alternative, Simon recommends replacing the lamb with cubes of roasted squash. Finding the right wine for a traditional Sunday roast is the question I am often asked. I thought that as we’re having a roasting joints AND wine sale it was the perfect opportunity to go through some wine options for all the different joints of meat you might be roasting next Sunday.